Mrs. ReaderPants: Happy Book Chocolate Cake Day! Happy Book Chocolate Cake Day! Warning: The post is full of chocolatey-deliciousness and may therefore be bad for your waistline. You've been warned! But if we want to create lifelong learners, we must create lifelong readers. Far too many students graduate from high school or college, having never experienced the joy of falling in love with a book. Although they may spend many hours each day reading text messages, FaceBook posts, blogs, and mainstream news articles, this is hardly the same as investing an afternoon in a good story or reading to learn more about a personal hobby or interest. Students (and adults) may be well-versed in reading social sites or half-told news articles, but many don't choose to read books after their formal education ends. WHEN DO OUR STUDENTS EVEN HAVE TIME TO READ? So how do we help our students learn to enjoy reading? Well, I think part of the solution is making reading more glamorous, more fun. Students need to see reading as something they want to do instead of gaming or watching YouTube videos. A tall order, yes, and one that isn't easy to achieve. But at the very least, students should have regular reading experiences that are not solely based on school assignments. Can we really blame students for not reading when we as teachers do not give them time to read a book they are interested in, with no strings or assignments attached? On any given weekday, if you take out sleeping time, today's kids spend more hours at school than they do at home. My own children are at school for eight hours each day and more than nine hours if they have an after-school club. On an early day, they arrive home around 4pm, leaving them about five hours of home time during the week. That sounds like it would be plenty of time to read, right? But they also have to do homework, eat dinner, shower, and get ready for the next day. And that doesn't count any after-school daycare programs, chores, sports, tutoring, music lessons, etc. that so many young people also have in the evening hours. Add in distractions from social media, TV, friends, family members, pets, and a million other things, and it's no wonder reading is not at the top of the list of things to do. Most adults do not make time to read after work; why would we think kids would be any different? Anyway, I know I am preaching to the choir here. Over-scheduled lives flecked with constant distractions are today's reality, both for children and adults. I do not expect to change that with this one idea. But I do think that we should do everything in our power to help students understand that a love for reading can and will happen to them...if they look for and find the right books for them. VEGETABLES ARE GOOD, BUT DESSERT IS DIVINE! For several years now, I have put a chocolatey face to books that students read for pleasure. I believe right down in my bones that when students say they "don't like reading," they are really telling me they haven't (yet) found a book they absolutely devoured. How many librarians, teachers, or parents have recommended a book to a student, and that student came back to say it was their favorite book ever? How many students have become readers simply because they read Harry Potter or Twilight or The Lightning Thief? Well, my friends, these students love to read because they have found their Book Chocolate Cake. Book Chocolate Cake isn't necessarily healthy or good for you. It's probably not something you read for a school assignment or that you muddle through because your parents or teachers think you should read it. Reading for pleasure is the dessert, not the vegetables. Books we read for school or are forced to read are not usually the books we devour. As we do with gooey chocolate frosting, we smear our faces with the books we love the most. The books we read for school are more like vegetables or healthy brown rice; they may make you a more well-rounded reader, but do they really make your average young person go crazy with all the intrinsically-motivated book reading? Of course they don't. Finding Book Chocolate Cake isn't easy for everyone. Students may need to read 10, 20, or more books before they find a book they can devour. They need to know that is okay to not know your Book Chocolate Cake (yet). The most important thing is that they keep looking and trying out new books, perhaps seeking the guidance of a friend, teacher, or librarian for recommendations. 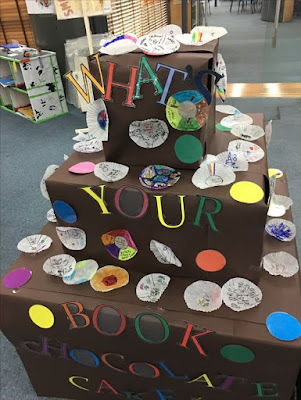 So how do students know if they have found Book Chocolate Cake? It's easy! If teachers, parents, YouTube videos, FaceBook, text messages, or motion sickness can't them stop reading a certain book, they've found their Book Chocolate Cake. That 8th grade boy furtively reading Naruto under his desk? He's feasting like it's Thanksgiving Day. That 6th grade girl slumping in her chair because she finished Tiger's Curse last night way past bedtime? She's having a Book Chocolate Cake hangover today. The analogies are endless! I love the idea of Book Chocolate Cake so much that I decided this year to theme a whole day around it. So what are we doing in my school today to celebrate Book Chocolate Cake Day? Once that basic structure was set up, I got brown posterboard (butcher paper would have been better, but we don't have butcher paper at my school) and created the chocolate layers. Next year, I will find some brown cloth to cover the layers instead; I think it would be easier and would stand up to lots of students touching it much better. Our younger students this week keep trying to pull up the bottom of the paper to see what's under it, and it's just a matter of time before it gets messed up enough for me to take it down. Once the chocolate layers looked yummy enough to eat, I decorated with letters and dots for sprinkles. This is another part that would have been easier if I could have gone to Hobby Lobby in the USA. Next year, I will use cotton to trim the cake with white frosting, or maybe use colored cotton balls for three-dimensional sprinkles. The finished product (minus the students' cupcake wrappers) appears in the photo at the top of this post. The last part of the chocolate cake is the most important. 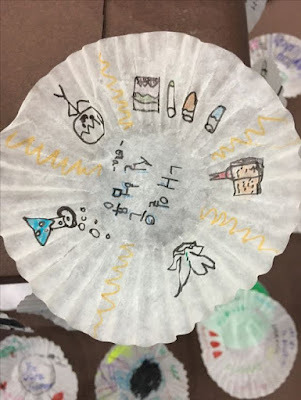 Throughout this week, students have been decorating a cupcake wrapper to reflect their Book Chocolate Cake titles. I tell them they may decorate in any way they like. I put symbols from the book on mine. Another boy wrote thematic words that went with his book. Some did favorite quotations. Others just wrote the book's title and drew a picture. The Book Chocolate Cake display will stay up through the month of November...if the bottom layer can last that long. Okay, I have to admit that I fell down on this one. I'm new at my school, and it turns out that if I ask the cafeteria to provide a certain type of food, they will make it for the students. I ran out of time to make that happen this year, but I will definitely request chocolate confections be offered during lunchtime next year. Check with your school cafeteria...you never know when they might say yes, especially if you are at a private or international school where they actually cook food in the school kitchens. 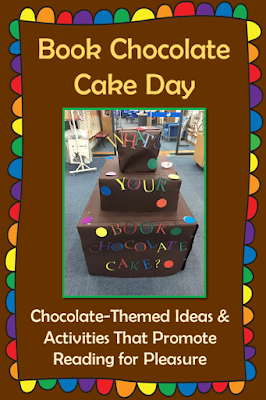 It might also be fun to do a Book Chocolate Cake decorating activity, where students decorate store-bought chocolate cupcakes for their favorite book. We do a cake decorating activity at our Shanghai Battle of the Books every year. 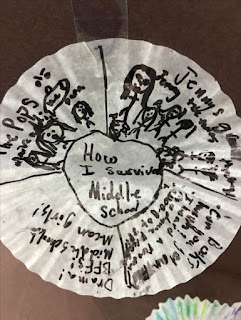 In groups, students decorate a 9" round cake, using decorations they brought with them as a team. The team decided before the BB competition how they wanted to decorate their cake and what they wanted to bring for decorations. And yes, we ate the cake (of course!). 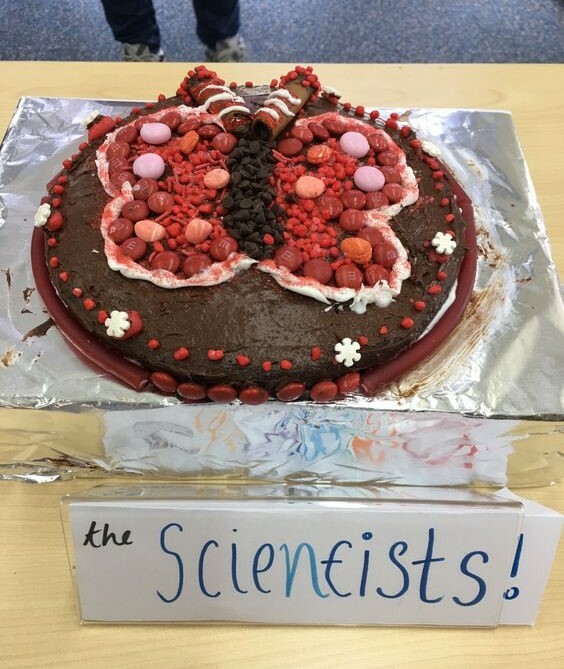 This is a cake from our Battle of the Books competition in Shanghai in April 2017. 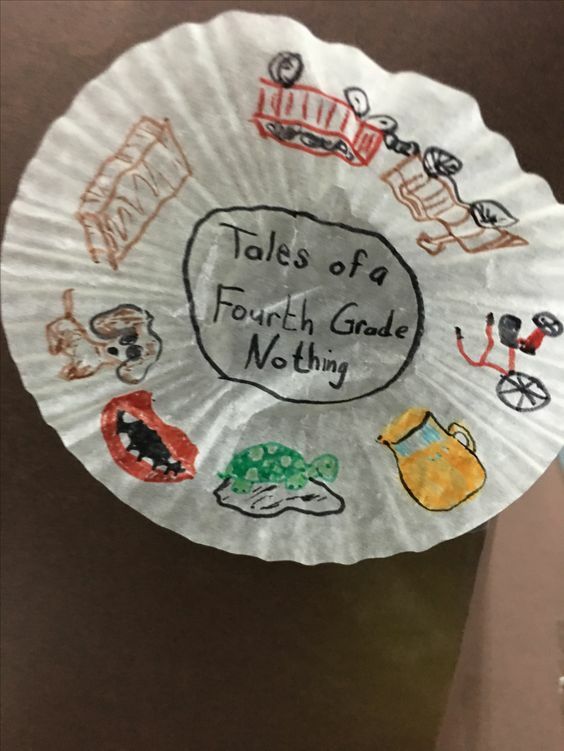 Can you guess the book they chose? Hint #1: It's a color and an insect. Hint #2: The color and the insect are both on the cake. Hint #3: My review of this book will tell you the title. There are loads of chocolatey treats you can give students, and they don't necessarily have to be edible. We gave out chocolate-scented stickers for the little ones when we "caught" them reading. We bought our stickers here in China, but I found these and these on Etsy (both are unscented). If you are looking for scented stickers, these are cute, and they can be used for other occasions as well. There are loads more available on Etsy as well. 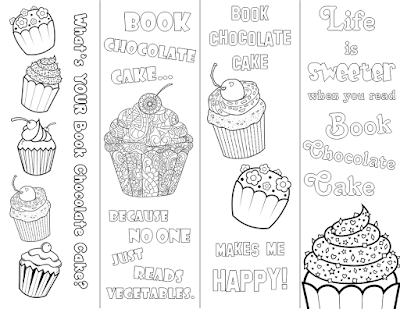 I created four different Book Chocolate Cake bookmarks (to color!). They are free and located on my TPT store and through my ReaderPants Store. This one is pretty simple. Students bring in their favorite book and share it with the class. Yes, even surly secondary students who claim to "hate reading" probably have a picture book they loved as a youngster. If students do not have a copy of the book, they could check the school or public library, or they could simply bring in a picture or just tell the class about the book. As I mentioned, this is my first year to theme a day around Book Chocolate Cake. And as usually happens when we try something new, it doesn't go as smoothly as we hope it will. Despite some hiccups, I definitely plan to do Book Chocolate Cake Day next year, but with some modifications. First, the students understandably thought they would be eating chocolate cake today at school. I do not blame them one bit; any day themed around chocolate cake should involve actually eating chocolate cake. So next year, I will arrange for our school cafeteria to make us some chocolate cake. If your cafeteria does not have this ability, you could do the store-bought plain cupcakes idea and have students decorate the cupcakes themselves. 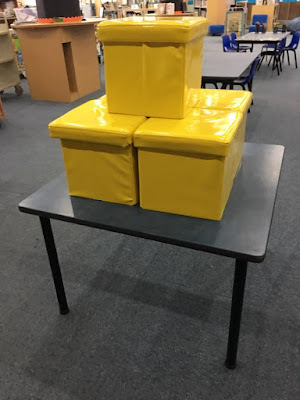 If budget constraints do not allow this for your school, you could ask PTA or room parents to donate chocolate cupcakes to their child's class. Also, be careful for the nut allergies. I originally had a plan to give out individually-wrapped snack cakes to students, but we had an accidental nut-allergy exposure in the weeks before Book Chocolate Cake Day. I immediately scrapped the idea because the cakes I planned to buy contained hazelnut creme (as do many prepackaged chocolate treats). The last thing we want on Book Chocolate Cake Day is for a student to associate their Book Chocolate Cake with a hospital visit or worse. Please, please be careful. I would also extend it to Book Chocolate Cake Week. That's kind of what it ended up being at my school this year, even though I called it Book Chocolate Cake Day. This would also give lots of opportunities to "catch" students reading so they can get a sticker. Doing it all in one day really puts the pressure on teachers to catch every student reading in that one day. If it is only done in a day, the teachers are more likely just to give DEAR time and hand out stickers to everyone. I think it's better to catch them reading naturally (you'll be watching for those readers! ), which would be so much easier and more authentic over the course of a week. The Book Chocolate Cake structure will be made of cloth instead of paper next year. I think a paper structure will last a couple of weeks, but it wasn't easy to put together with thick posterboard. Most schools in the USA will have butcher paper, so that will surely work much better. I might also make the Book Chocolate Cake structure end about 3" above the floor. Students were constantly lifting the posterboard up, curious about what was underneath and what was holding it all up. It just added to the wear and tear of the structure. And can I just say that folding and cutting and shaping thick posterboard is not how I want to spend my morning. A dark brown piece of cloth will be so much simpler for creating tiers, and it will look better as well. I will order thicker cupcake wrappers. These were a bit thin, almost as thin as rice paper. Again, this is casualty of living in China. To avoid going from store to store to find them (in China, the stores have what they have), I ordered the cupcake wrappers online from a Chinese website. We didn't know they were so thin until received them, and by then, it was too late to order more. Finding proper cupcake wrappers won't be a problem if you live near a large grocery store. So that's our first-ever Book Chocolate Cake Day! I will totally do it again, and I'm sure over the next year, I will think of, find, and hear about lots of other fabulous chocolate-inspired reading ideas. Please help spread the chocolatey goodness! What do you think of Book Chocolate Cake Day? Would you do it in your school? What other ideas would you recommend? Thanks for writing up such a detailed post about this! I'd love to implement it next year. You're awesome, as always.